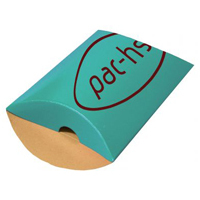 Pac-hs supply printed boxes and cartons. These are supplied flat for self-erect, making them ideal for efficient storage. These are available as cases, box and lid, or pillow pack styles. These are ideal for improving the packaging of your products. Branding your boxes with a design or logo ensures that your business is being effectively promoted. We offer an extensive catalogue of standard products that can be branded with one or two colour print with your name or logo for smaller quantities than a fully bespoke alternative. Click here to complete our boxes enquiry form. For special applications a range of printed cartons can be supplied in full colour process print in quantities as small as 1,000 dependant upon size. These are particularly suited for the giftware and promotional market and can be supplied in a number of shapes. 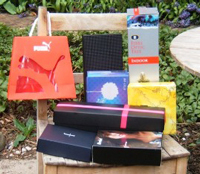 Designer boxes are a range with a cut out lid design in a choice of size and colour. The cut out lid can have two colour materials printed. We have a range of boxes with lids, such as: Elegance Classic, Opulent, and Designer. With different sizes and colours, one will look perfect with your name or logo. Conventional box for gift or clothes boutique and can be laminated in corrugated or solid board. Please contact is for more information on your personalised box. Our range of side flap boxes are Gift, Pillow, and Porta. These products are all different sizes, colours, and features. Suitable for small goods, scarfs, lingerie, etc. Cheap and very easy to pack which are perfect for internet retailers. Can be securely closed by a label. This can be litho printed or printed with a full-colour or transparent label. The Rubix box is a box and a bag. 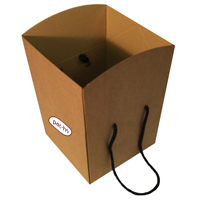 It is a natural brown cardboard box which can be carried around as a bag, perfect for fragile items. This box bag can be used as a food hamper, or a gift box so there is no need for a carrier bag. You can also have a window on the box.